This adjustable swivel barstool offers a chic contemporary look with black faux leather upholstery and a chrome base. A modern update for your kitchen or bar area. This sleek armless barstool features stylish diamond-pattern stitching on black faux leather upholstery. A shining chrome finish decorates the stainless steel base. For extra convenience, the swivel seat can be adjusted from counter stool height to bar height. 21 1/2" wide x 20" deep. Adjusts from 35 1/2" to 43 1/2" high. Weighs 22.7 lbs. Seat height adjusts from 25" to 33" high. Square base is 16 1/2" wide. Modern adjustable swivel barstool from Sunpan Modern. Black faux leather with hand-crafted tufted detailing. Chrome finish over stainless steel base. 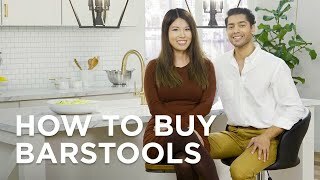 Seat adjusts from counter stool height to bar stool height.